On Tuesday, February 15, the team visited Inola Tucker in Questelles and had an enjoyable and exciting time with her, as she reminisced on her days at GHS under Headmistress Laura Smith Moffett. She recalled the strict discipline and traditions of the school which the students had to conform to in relation to dress code and conduct of students in and out of school. Tucker also had fond memories of certain teachers and spoke about the curriculum. French was one of her favourite subjects, but unfortunately there was no oral component then. She remembered getting a prize for placing first in French and felt disappointed that she could not locate it for display. 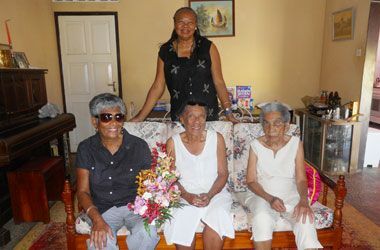 She was elated about the visit and was especially happy to share it with her husband George, who was celebrating his 82nd birthday on that very day. She stated that this activity was an excellent idea and expressed her thanks to the organizing committee for remembering her and other past students. Tucker was presented with flowers, fruits and GHS mementos, while George received a bottle of wine as a birthday token. The visit ended with a prayer offered by Tucker, who wished Godâs speed and blessings on the Headmistress, staff and students. There were two other visits on Friday, February 18, to Winifred King of Villa and Jean Duncan of Prospect. The first stop was at King, who also attended GHS in the 1940âs. Winnie, as she is affectionately known, also shared similar experiences and recollections as Tucker. She too spoke about the discipline, uniform and curriculum and some of her schoolmates and teachers. She recalled the pranks played by students and punishment meted out when they were caught, but stated that they still enjoyed school days and had clean fun and laughter, especially their little picnics down at the grounds next to the tennis court, which was of course not paved in those days. The visiting team then proceeded to Jean Duncan at Prospect, another past student from that era. She gave recollections from school, and like Tucker and King, viewed and listened to the lecture series on television, since they were unable to attend the actual lectures. She, too, has been listening to radio, television and printed media to keep abreast of activities planned for the Centenary celebration. Duncan, although not in the best of health, expressed the desire that she might be able to attend one or more of the culminating activities leading up to May 8, 2011. She is hoping that her sight, which is part of her health problems, will improve to allow for this. Duncan was presented with a floral arrangement prepared by King and GHS mementos of a bag and centenary pin, which Tucker and King also received.